Brenda J. Robles is a California State Certified Medical Interpreter with 21 years of experience in Simultaneous, Consecutive, & Conference Interpreting in Healthcare and Law. Robles received her B.A. degree from the University of California Riverside with a major in French Literature and a minor in International Relations. She began her career as a professional Interpreter in California and relocated with her family to Maryland in 2006. Ms. Robles has been at the NIH since November 2006 and became the Language Interpreters Program Manager in 2008. Robles possesses extensive linguistic experience in diagnostic, ambulatory, interventional procedures, oncology, hospice, and palliative care in the acute care setting. Brenda was co-author of the Medical Interpreter/Translator Code of Ethics at Riverside County Regional Medical Center (RCRMC) which established a successful Interpreting Model founded on the standards of confidentiality, accuracy, impartiality, professional boundaries, cultural and patient advocacy. Robles’ commitment to Interpreter Ethics was instrumental in the development and implementation of the current Policy & Procedures Manual for Medical Interpreters Clinical Center Social Work Department. Robles currently conducts Intramural Trainings at the NIH in Effective Cross Cultural Medicine for Doctors and Nursing Staff, Utilization and Role of Medical Interpreters, The Art of Simultaneous Interpretation in Medical Encounters, and Medical Interpreter Competency Trainings for LIP Volunteers throughout the Clinical Center. As Deputy Director of the National Institute on Aging (NIA) at the NIH, Dr. Bernard serves as the principal advisor to the NIA director, working closely with the director in overseeing over $1.5 billion in aging research conducted and supported by the Institute annually. Dr. Bernard received her undergraduate education at Bryn Mawr College and her M.D. from University of Pennsylvania. She now co-chairs two Department of Health and Human Services Healthy People 2020 objectives: 1) Older Adults, and 2) Dementias, including Alzheimer’s Disease. 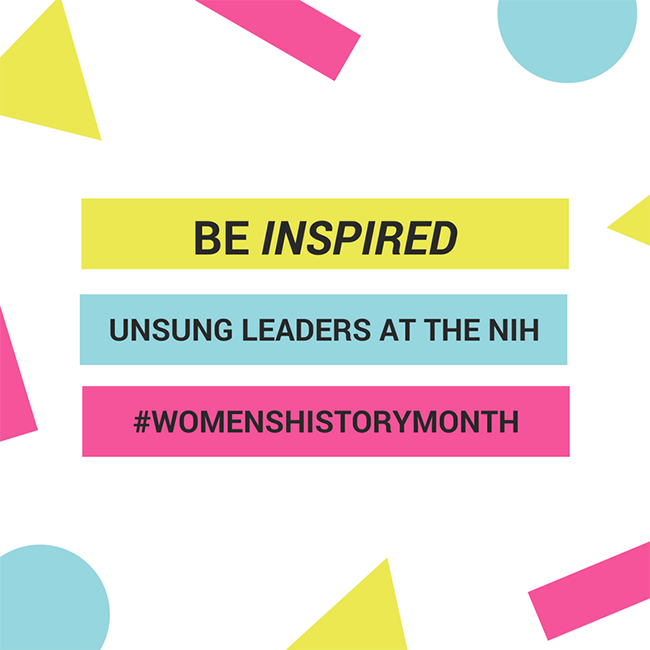 Within the NIH, she co-chairs the Inclusion Governance Committee of the Extramural Activities Working Group, chairs the Women of Color Committee of the trans-NIH Women in Biomedical Careers Working Group, and serves on the Diversity Working Group. Dr. Bernard has held numerous national leadership roles, including chair of the Clinical Medicine Section of the Gerontological Society of America, chair of the Department of Veterans Affairs National Research Advisory Committee, board member of the American Geriatrics Society, president of the Association for Gerontology in Higher Education, and president of the Association of Directors of Geriatric Academic Programs. She has lectured and published widely in her area of research, nutrition and function in older populations, and on issues related to geriatric education. She has been recognized for her leadership in geriatrics; in 2013, she received the Clark A. Tibbits Award from the Association for Gerontology in Higher Education, and in 2014 was awarded the Donald P. Kent Award by the Gerontological Society of America. Dr. Mann Koepke is a life-course developmental cognitive neuroscientist/psychologist, with a focus on the neurobiology of learning and cognitive development, and cognitive disabilities throughout life, in both animal and human populations. She has served the National Institute of Child Health and Human Development (NICHD) as the Director of the Math & Science Cognition, Reasoning & Learning - Development & Disorders Program within the Child Development and Behavior Branch since 2008, where she is dedicated to building the research base on the development of math and science cognition, reasoning, and learning, and to providing an evidence base for interventions for individuals with learning disabilities in these areas. Dr. Mann Koepke takes her passion and advocacy on behalf of persons with disabilities of all types to the communities she lives and works in. From serving on local government advisory groups (e.g. Commissioner, Montgomery County Commission for People with Disabilities), and creating innovative patient and family interventions to enhance real world function (e.g. the multi-award winning “Alzheimer Page”; created in 1990, the world’s first free interactive educational website for professional and family caregivers of persons with dementia), and founding “Working with MS” to promote solution-focused problem solving for persons working or wanting to return to work while living with Multiple Sclerosis (MS), to founding the NIH “ABILITIES” ERG group and listserv with the mission to foster a welcoming, supportive, and respectful workplace that promotes success for all NIH staff, regardless of ability or disability. Dr. Mann Koepke works toward breaking down barriers, fostering inclusion, and creating opportunities for persons with every ability level. Tammie’s strategic and enthusiastic leadership of NIH Medical Arts has transformed the organization through the years while maintaining focus on the mission: to deliver excellent, insightful creative work for the NIH community. A leader with true team credentials (she’s a former captain and star of Virginia Tech Women’s Basketball Team), Tammie inspires her staff to uphold core values of customer focus, excellence, integrity and collaboration by leading through example. In addition to leading Medical Arts, Tammie is Acting Director of the Division of Scientific Equipment and Instrumentation Services (DSEIS) also within the Office of Research Services (ORS). Teresa Booher (Shea) is the third of six children born and raised in Maryland. After complications of an illness, she suffered severe vision loss leaving her legally blind at the age of 24. In 2011, Teresa resumed her career in Information Technology (IT), joining federal service at the NIH. In addition to her role as an IT Specialist, Teresa is recognized as an advocate, speaker, educator and leader in the areas of Diversity and Inclusion focused on persons with disabilities. She is the founder and lead of the NIH independent resource sharing group, 3 Blind Mice. Teresa has been recognized for her outstanding work in the IT field as well as her commitment and efforts in reaching fairness and equality in the workplace.